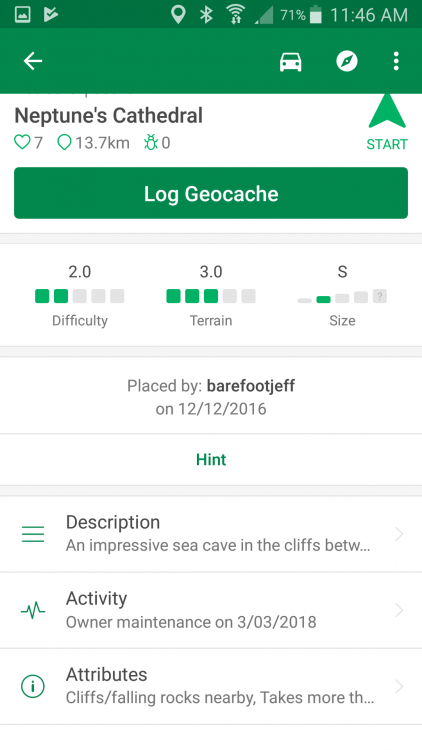 With this week’s Geocaching® app update, we’re unveiling a great new look for cache details. We’ve been working to make the app easier for everyone to use, which is why we (with the help of months of player interviews and research) felt improving cache details was an important step. We’ve simplified the design and eliminated a lot of scrolling to make it easier to access the information you’re looking for. Buttons to message a cache owner and view hints are front and center. The cache description is now in the new menu, so you’re only one tap away from getting all the details. With a quick glance, you can now easily see the latest activity on a cache. Some app users will start seeing the new cache details today, with the new look becoming available to more and more users each day. This allows our team to squash bugs that may be reported during the week. We hope to have the new look available to all users by this Thursday, April 19. I like the move back to a scale rather than dial for ratings. I updated but don't have the new design yet, so I'll hold further comment until testing. But generally I do like the new look better per the included image. The screenshot does not indicate a size for your geocache. If the C/O has indicated a size, will it still appear as text as well? 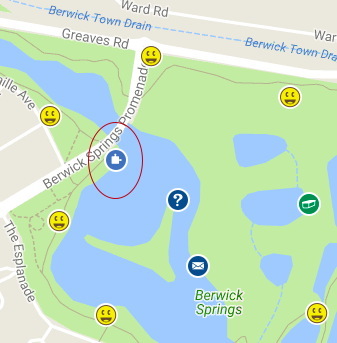 Does the Geocaching HQ really have 138 trackables in it's inventory? What will you see when expanding on these tabs? Will the graphic for Activity change if the last log was DNF or perhaps if it hasn't been found. It should. It seems like "Message" has very high prominence in the display relative to it being what I would consider a seldom used feature. I would still prefer a few lines of the description to immediately be visible when opening the cache. Not a fan of hiding the owner's profile photo/picture. Please include a filter for favorite points on caches on the mobile app. Putting the "Placed on" date and "by" owner at the very top, 2nd line down after the GC code, and restoring the Owner profile photo and "contact/message" button back to the bottom. On first glance, there's no indication at the top level (screenshot) of # of TBs (if any as you scrolled down), # of waypoints, images, etc. Will need to see how this plays out with live data and clicking through to find nothing or a lot. I hope the hint is disabled if there's no hint vs clicking it to see "No hint provided". When in the field and looking for cache, I am most interested in two things – HINT and previous logs to check cache foundability and may be some spoilers about finding actual container. In my opinion, nobody is interested in MESSAGING cache author in first place. For this simple reason, more reasonably is to place HINT and LOGS (or ACTIVITY, whatever you call it) at first place and move MESSAGE button down. Good points. Then again, in my experience I assume the number of trackables in any given cache to be zero until proven otherwise. I do think the hint should be grayed out if none exists. Agreed. The same should happen for Attributes, Photos, Trackables, and Waypoints. I'm curious what the mysterious "Info" option at the very bottom does. It does appear that a bug from the old version has carried over to the new version. If you look at the "before" screenshot, you can see that the text "Other" is also missing there. I'll wait until I see it in action before commenting further, but I'm concerned at the reduction of the Description to just a single line, giving even less incentive for people to read it and making me wonder why I bother writing it. Also with the attribute icons I could see at a glance if there's anything I should be particularly aware of (like thorns or stinging plants) but with them spelt out in words, only the first couple are visible without expanding the field. And weren't all the attribute graphics on the website recently changed to align them with the app? That seems a bit pointless now if the app has got rid of them altogether. And weren't all the attribute graphics on the website recently changed to align them with the app? That seems a bit pointless now if the app has got rid of them altogether. Good point. It could be that the icons are still displayed once you select the Attributes option, but that would then beg the question, why replace the icons with text on the main page? 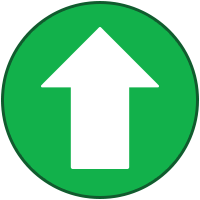 A visual cue like an icon is much faster for the brain to process than reading some text. The large, prominent MESSAGE button implies that there is a cache owner waiting to help you or answer your question. NOTHING CAN BE FARTHER FROM THE TRUTH! I suggest that button be hidden layers deep, to avoid the misconception that a finder can expect a reply in any sort of a timely manner. I like the scale for D/T and size much more than the dials. I also like the removal of the CO picture/icon - that's not needed. I was a bit surprised when we were out caching this afternoon, and I opened a cache page to get some details and lots of things were moved around!! I knew where the info I needed was located, but I really had to look around for it today. As I use it I will get more familiar with where things are... and then I can let you know if I like it! Also with the attribute icons I could see at a glance if there's anything I should be particularly aware of (like thorns or stinging plants) but with them spelt out in words, only the first couple are visible without expanding the field. And weren't all the attribute graphics on the website recently changed to align them with the app? That seems a bit pointless now if the app has got rid of them altogether. The icons are there with one tap on the arrow - both the icon and the description, so it's very clear what the icon means. All it does is give the definition of the cache type - traditional says "This is the most common geocache type. Navigate to the geocache location and look for the hidden container. Read the details if you get stuck, and don't forget to sign the logbook!" Favorites, distance to coordinates, and #trackables is still where it was. I do like seeing the last log posted with a date, as that's one of the first things I check when deciding what I'm going to go after. One click (which is what it took before) gets me more info if I need it. Using it more will let me see if I like the changes or not. I'm still getting used to where things are! So it really is a forlorn hope that people might possibly be encouraged to read the description before getting stuck. Maybe I'm the rare exception, hiding caches in places that could be tricky to reach, but in my descriptions I include things like suggested safe ways of reaching GZ or warnings about only attempting it at low tide with small seas. I, too, put some effort into my descriptions, though the caches are not hard to find or in potentially hazardous areas. They are themed and have alot to do with WHERE they are hidden and WHY I brought people to the area. And I also READ other descriptions - I often glean valuable information about the hide, or clues to how it's hidden (some local cache owners give hints in the description, purposely!!). So I do read descriptions, and feel disappointed if all it says is "This place needed a cache, and I had the container in my car, so I hid it here." Yes. Take GC6Y0R7 as an example. Someone looking at just the map might decide to access it from Ascot Avenue or Fairscene Crescent, but that would involve climbing down an almost vertical 40 metre cliff and they could easily find themselves literally stuck halfway down before reading the description and discovering that the recommended approach is from the south along the shore. With this relegation of the description to just something to read when all else fails and the proposal to open up higher D/T caches to muggles with apps, I'd have to seriously consider whether to continue placing caches like this. I'm with those who want the Description more prominent on the screen, not hidden a layer deep. I think it is a great improvement, but would the owner related stuff and the hint to the bottom. How about putting the description underneath the D/T/size and expanding it to show the first 25 lines? That should be enough for most caches and for the others clicking on the text would open the complete listing, just as it does now. We hope to have the new look available to all users by this Thursday, April 19. I got the update on Tuesday, and my husband got it today. I don't know about any of the other local cachers - there are 2 events I'm attending on Saturday (a CITO, and then pizza meet & greet after the CITO) and the changes will likely be a topic of discussion. Though a side by side picture like at the top post appears more streamlined, real usage for seeing the data seems less efficient - multiple clicks into each section. There should be an expand all option and possibly a persistent application setting. Disappointing that hints and sections with no info such as photos or waypoints require clicking into to determine there's nothing to display! This is UX 101 and I can't understand why the poor experience carries over to a new UI. There are so many different displayed clickable items that have no UI consistency. Eg. Hint and Message look like buttons with green text. All the collapsed sections have grey text. Cache owner above looks didn't. Below the sections are more clickable items that are clickable grey text that remind me of disclaimer text - info, open in browser, etc. Feels like each section was developed by a different developer without knowledge of what the others were designing. More appropriate might be the ... icon at the top of the page for those stragglers at the bottom of the screen. Description display option should include Source view as that is often useful for puzzles. The message "button" seems unnecessary with it also available by clicking the cache owners "button" above it. Personal note should be on the main panel and display text similar to description. It shouldn't be relegated to the ... icon. On an event cache, the UX for the main button is very non-standard - a single button for Log Event and Add to Calendar depending on where you click? On Waypoints, the waypoint name is truncated if it's too long and I don't see a way to see the whole waypoint name. If viewing am existing waypoint for a cache in the Edit screen, the Current Location a Waypoint has the bottom of the lat/long cutoff. It would be nice if some phone features such as long tap/press displayed underlying text vs drilling in, etc. Description text shows HTML entities in the collapsed view (eg &nbsp). See cache GC7EQPW for an example. UI consistency - Green "log" buttons throughout except on the TB within a cache screen where it's "Log" in blue text on white background with blue border. But if you drill into the TB from the TB in a cache screen, the log button is again a green button. I received the update yesterday and my initial reaction was great. This looked good although it took some time to find every thing I needed. But having used it for 24 hours I have discovered a major issue. I like to solve Puzzles and Multi's, but I do not always collect them until I get back to the location. So I enter the solved coordinates into the cache by clicking on the pencil Icon to the right of the cache coordinates as shown below and change them to the new coordinates. 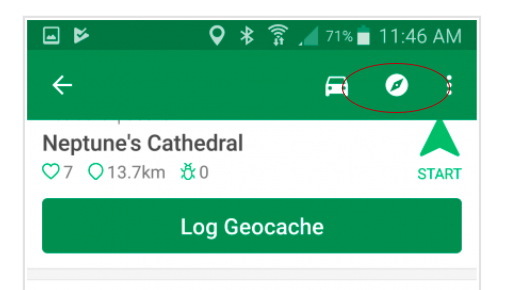 This relocates and changes the cache icon to a jigsaw on the map so I can see at a glance that the cache is already solved and ready to be found. Simply adding a waypoint will not show me that the cache has been solved. However when I use the compass or the vehicle guidance option, it uses the original coordinates and not the changed coordinates which takes me to the wrong location. This process worked perfectly before the update, so please get this bug fixed ASAP as it is extremely frustrating to search for solved caches now. However when I use the compass or the vehicle guidance option, it uses the original coordinates and not the changed coordinates which takes me to the wrong location. This process worked perfectly before the update, so get this bug fixed ASAP as it is extremely frustrating to search for solved caches now. I had a similar thing happen after a previous update a few weeks back. I logged out of the app then back in again and it all came good. Hi Barefootjeff, Thanks for the advice. I have just reset the app as suggested and the cache that I tried searching for a few hours ago now has guidance to the new coordinates. But then I deliberately reset the coords for another local cache and tried it again. This time it set a route for the old coords even though it showed the cache at the new cords on the map. I then reset the app but it has not corrected the route this time. Maybe there is some delay with the server? There is definitely a bug in here somewhere. I shouldn't have to reset the app every time I change some cache data. Thanks for reporting your problem. Are you using the Android app or the iPhone app? If it's the Android app, it's a new problem that we'll need to investigate. If it's the iPhone app, we're already aware of and working on fixing a bug regarding driving directions to solved coords. On the iPhone app the driving directions currently will route you to the posted coords if you start driving directions before navigation in the app (hitting Start), but will route you to the solved coords if you start driving directions after navigation in the app. So in the short term there is a workaround and we're working to fix the bug. Today was my first day with the new app. Like others have said before I would prefer to see icons instead of text for the attribute because without clicking I only saw 1.5 to 2 attribute now instead of the 5 before. Also, I would suggest to put the winter-friendly (or not WF) attribute first because in a Nordic country it's one of the most important attribute to know. Also I would put the CO and hint section at the bottom because its not the main info at the beginning of a search and on my Android I need to scroll to see the activity section. Speaking of the activity it's a great addition but when the last log is a DNF we don't have the (!) pop-up anymore and I found it useful. I would expand the description to more than 1 line too like others have said. For the D/T could it be possible to put stars instead of lame square. Finally, I would suggest to put the coordinate of the cache on the main page or at least that we don't need to click again on the waypoint section to see them because I sometime enter the coordinate manually in my GPS and its a lot of clicking. A few lines down in the description are instructions on how to safely access the cache and warnings about only attempting it at low tide with small seas, but that's now hidden. Worse, the Info button says you only need to look at the description (well it calls it Details but there's no "Details" button) if you get stuck. The other big problem I see is the attributes, with only the first one and a half visible. Yes, the cliffs/falling rocks warning is visible, but the "Wading Required" and "Not Recommended at Night" aren't. While this cache doesn't have them, there are other safety-related attributes like Dangerous Animals, Ticks, Thorns, Poisonous Plants, Difficult Climbing, Not Suitable for Children, etc. and land manager related attributes like No Dogs, No Bikes, No Vehicles, No Campfires, etc. which can never all be visible at once as was previously the case. To me, this cavalier "hit go and follow the arrow, no need to look at anything else" approach is a recipe for accidents and I must really now consider archiving this cache. Edit to add: I just checked the driving instructions and it says to go to the corner of Ascot Avenue and Avoca Drive, but to access the cache from there would require climbing down a 40 metre cliff. It seems my Parking waypoint is ignored too. I'm in the same camp that I would prefer to have more of the description shown and the immediate visuals of the attributes, as it was in previous version of the app. Otherwise I like the look of it, but need to get used to the new format. 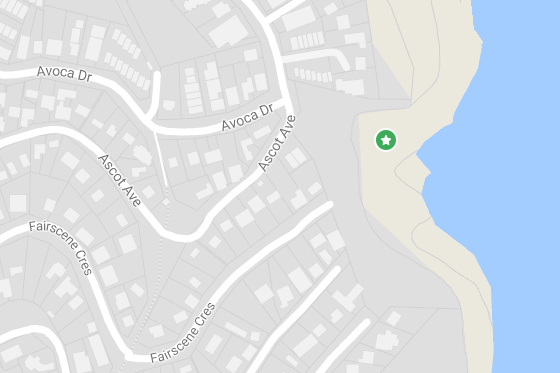 I just checked the driving instructions and it says to go to the corner of Ascot Avenue and Avoca Drive, but to access the cache from there would require climbing down a 40 metre cliff. It seems my Parking waypoint is ignored too. Interesting idea for cache level routing to use parking waypoints. Caches provide none, one or multiple. You probably ashtray know that can first select a waypoint by expanding the waypoints from the main cache screen, selecting a parking waypoint and then hitting start under there waypoint. It seems the Waypoints entry on the main cache screen is always present whether or not a cache has additional waypoints, with no indication on the main screen of what if any additional waypoints there might be. So unless someone was in the habit of always opening the waypoints entry, they wouldn't be aware from the app that the cache even had a parking waypoint. As a simple-minded soul, I'd have thought a sensible approach would be to base driving directions on the parking waypoint if there is one, on the nearest one if there are several, or if there aren't any just use the cache coordinates, but no doubt there are reasons this couldn't be done. Unfortunately with this particular cache, the driving directions lead to a very dangerous approach route. I completely agree and feedback I provided here in 2 different posts - no indication of anything in the collapsed sections until you spend time clicking thru. If they feel this is an optimal for some folks, which I don't but that's subjective, they should provide a way to Expand All and have it as a configurable default setting. I've now archived the cache in question (GC6Y0R7), Yes, there were other factors in my decision, including last year's rockfall that buried the original container and evidence of fresh rockfalls on the approach to GZ, but these changes to the app that could easily have led someone to approach GZ from the top of the cliff really made it untenable. Unless it really is the intention to reduce geocaching to just point-and-go roadside P&Gs, could some consideration be given to better accomodate caches like this where the closest road to GZ isn't the best approach and/or important safety information needs to be conveyed to the seeker prior to them getting stuck? I'm curious as to why there is still no + - control for map zoom. The current system requires two hands (one to hold the phone, and two fingers on the other one to pinch for zoom in and out. With other apps I can hold the phone in one hand and pan and zoom in and out with just my thumb, which leaves the other hand free. I've gotten spoiled by another geocaching app that lets me zoom using the volume buttons. That ends up being really handy. I've gotten spoiled by another caching app that lets me zoom using the volume buttons, or with - and + buttons that are wide enough to hit with a thumb and not get the wrong one by mistake. I actually prefer the latter. New app build is available so this thread will be locked shortly. A fair bit of the feedback didn't receive any follow-up. I normally use my GPS, but this weekend while traveling I did some spontaneous geocaching, so I used my phone. And I got the update during that time as well. The two most prominent spots show 'Hint' and 'Message'. I would prefer them to be 'Description' and 'Hint', as these are what I need most during my search. Since Message is not likely to give a timely response, it is not particularly useful in that prominent location. Also, on the map screen when I touch an icon, I get a short bar/window that gives the name of the cache and some information, as well as 'Start'. This bar should also include the D/T Size, as these are among the first pieces of information I want to determine if I am even going to look for this cache. Based on those, I can decide if I even need to open the page and read further. Yes the app needs to encourage people to learn about what they're in for before going for the cache, rather than just getting them on the walk to gz. Don't care if it's "more work" for the lazy or impatient - it's a pertinent and essential part of the geocaching activity. The people who can't be bothered to find out about essential properties of a cache, like the type and ratings especially, probably aren't a best fit for geocaching as a hobby; they'll likely be more upset than anything else, not knowing what to expect when they search. Listing -> GO implies 'just go here and you'll find it'. uh uh. Absolutely. The "Message" button is not a priority. The quick-view bar for a cache when you tap it on the map doesn't show some of the most important information: D/T and container size. While FPs and distance are important, those other details are equally important in deciding whether to seek a cache and could easily be displayed in the available space. The number of trackables is less important and doesn't need to be so prominent, especially considering the widespread inaccuracy of trackable inventories. The Hint and Message buttons are unduly prominent. The messaging function is already accessible by tapping the CO's name or from the Messages tab at the bottom, so the prominent button on the listing page is redundant and uses space where more important information could be displayed. The Description is not prominent enough. Seekers should be encouraged as much as possible to read the description, not discouraged as the current implementation does. The previous version showed at least a few lines, which was better than nothing, but even more should be visible by default. In the Web view of the description, large images aren't scaled-down appropriately and therefore can't be fully viewed (e.g. GC69DJR). The "Activity" label doesn't match the terminology used on the website. This should be relabeled "Logbook" to be consistent. Attributes only shows text labels on the listing page, and therefore can only show 1-3 at-a-glance. Icons should be used so most or all of them can be seen without having to navigate to a sub-page. Photos and Trackables should be disabled when none exist to be displayed. Please, please, please get rid of the completely unnecessary bouncing visual effect when opening or closing a listing. There's no reason for it and it slows things down. Likewise with the flying-in/out tiles on the search page and any other unnecessary animation. As was mentioned here, the listing page isn't scrollable on the first attempt. You have to try scrolling, remove your finger, then try again before it will work. It's my understanding that this has been the case for a long time. This also occurs when navigating back from a sub-page (e.g. Attributes back to the listing). The vague "Info" link should be relabeled "Cache type description" to better describe what it is. Searches fail for archived caches. This is a longstanding issue that needs to be resolved. Caches with size "Not chosen" are incorrectly displayed as size "Other". The filter doesn't allow filtering for the cache sizes "Not chosen" or "Virtual", which both still exist. The filter shows only the "Event" cache type and not CITO/Mega/Giga, but those types are included as part of the same filter option. This should be stated in the label, like "Events (incl. Event, CITO, Mega, Giga)", or similar. but cannot do this for solved coordinates for the reasons already mentioned. A solution for this will be extremely welcome. Hi Keith. You said that you're using an iPhone, but your screen shot looks like the Android app. Can you confirm which platform you're using? If it is iPhone, the same bug I previously mentioned about driving directions applies to the compass. We're still investigating a fix for that. In the meantime, the compass for a cache with corrected coords will accurately show distance to the corrected coords if you tap the compass after you've tapped Start to enter navigation mode.